Rick “Learning Curve” Perry didn’t know what the Energy Department does. 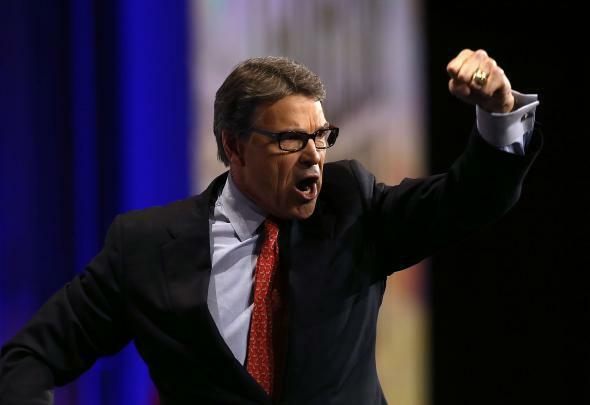 Don’t let Rick Perry’s trendy glasses fool you, the former Dancing with the Stars “star” is no nuclear physicist. The former governor of Texas, and occasional half-baked presidential candidate, has never been one for the nitty-gritty of governing, opting, instead, to swagger and twang his way through it. But now Perry is taking his swagger to the national stage, where we all can see it, as Donald Trump’s nominee to lead the Energy Department. Yes, Perry advocated for the elimination of the department on the 2012 campaign trail. Yes, he forgot the name of the department during a nationally televised debate. No, these are not good signs. Perry’s confirmation hearings before the Senate Energy Committee are set to kick off on Thursday, so the New York Times, perhaps innocently, published a preview-profile of Perry and the job he’s about to assume. So now Perry definitely knows what the department he’s going to be heading up does? “If you asked him now, he’d say, ‘I’m serious about the challenges facing the nuclear complex.’ It’s been a learning curve,” Perry campaign adviser and Trump’s Energy transition team member Michael McKenna told the Times. But Perry’s a fast learner, right? If approved by the Senate, [Perry] will take over from a secretary, Ernest J. Moniz, who was chairman of the Massachusetts Institute of Technology physics department and directed the linear accelerator at M.I.T.’s Laboratory for Nuclear Science. Before Mr. Moniz, the job belonged to Steven Chu, a physicist who won a Nobel Prize. For Mr. Moniz, the future of nuclear science has been a lifelong obsession; he spent his early years working at the Stanford Linear Accelerator Center. Mr. Perry studied animal husbandry and led cheers at Texas A&M University. Rick “Learning Curve” Perry, reporting for duty here at the … err … Department of … Yee-haw!